The NIKKI MARTINKOVIC DESIGN STUDIO specializes in unique, elevated, trend-focused print design for apparel, accessories, interiors and stationery products. Each curated collection consists of exclusive pieces of art with worldwide copyright, all created with various techniques that combine hand painting and drawing with digital design. We draw our inspiration from the latest runway shows, current art exhibits across the globe, NYC style and fashion, and of course our world travels - always having a strong pulse on global trends past, present, and future. Our collections are vast, producing over 600 prints a month, all originating from a hand-painting or drawing enabling us to work with all sorts of clients from various industries. Our clients are sure to find what they are looking for within our collection. Plus, we believe in the importance in quality artwork and pride ourselves in offering perfectly cleaned up and organized files. 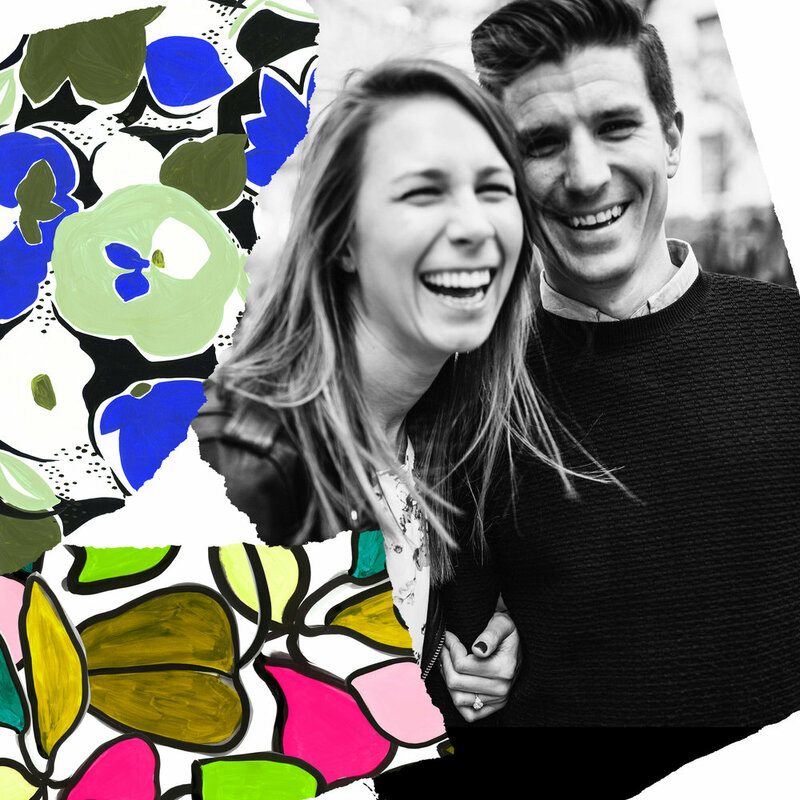 The NIKKI MARTINKOVIC DESIGN STUDIO began as a partnership between husband and wife, Kyle and Nikki, in 2015. With Nikki's creative eye and love for color coupled with Kyle's business brain and love for excel, we realized the sky was the limit. Nikki's passion for a career in creative design grew as she earned a degree in Interior Design and Entrepreneurship from Miami University along with a study abroad at the London College of Fashion. She then interned as a textile designer at a NYC startup fashion company, traveling to India to broaden her textile expertise. She relocated to NYC in 2009, lived as a nomad, and soon after landed a job at ALICE + OLIVIA where she worked in various areas of design and development including print, embellishment, apparel, graphics and e-commerce. In 2012, Nikki joined the MILLY design team focusing on apparel, print, and graphic design. This experience expanded her interest in textiles, and enriched her eye for color. Kyle attended Miami University as well (hint: that’s where we met) and earned a degree in marketing and psychology. After school, he move back to Chicago and focused his early career on marketing, working with an experiential marketing agency where he learned the importance of branding and client relationships. He later moved to NYC, to be with Nikki of course, where he landed a job with a startup that would later turn into a tech giant. He developed his startup business brain and always dreamed of being an entrepreneur. Combining our motivation and persistence along with our dreams of venturing out on our own, the NIKKI MARTINKOVIC DESIGN STUDIO was born. Together as a team, we love working together and have a strong vision of who we are as a brand.